If the analyzer incorrectly split the data into columns, select the appropriate field separators. After the data has been correctly distributed to the table's rows, check and, if necessary, copy the row types detected by the analyzer. 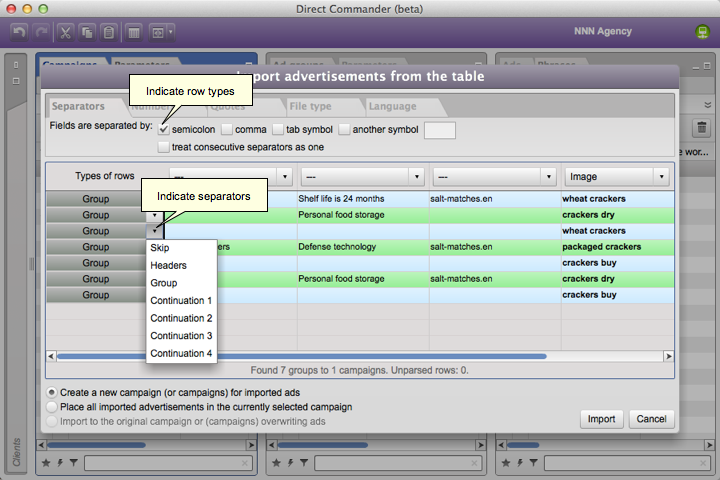 Rows with the “Headers” and “Skip” type will not be imported to Direct Commander. Values in rows with the “Headers” type are used by the analyzer to automatically detect column types. If several rows in the source file belong to the same group, use the row type “Continuation <number>”. Ctrl — to assign the type “Group” to the current row, and types in the same sequence in which they go after the previous “Group” row type to subsequent rows (when doing this, the last row's type is assigned to the remaining rows to the end of the table). This allows row types to be set for the first ad and then mark the first rows of ads in a table with a repeating structure. 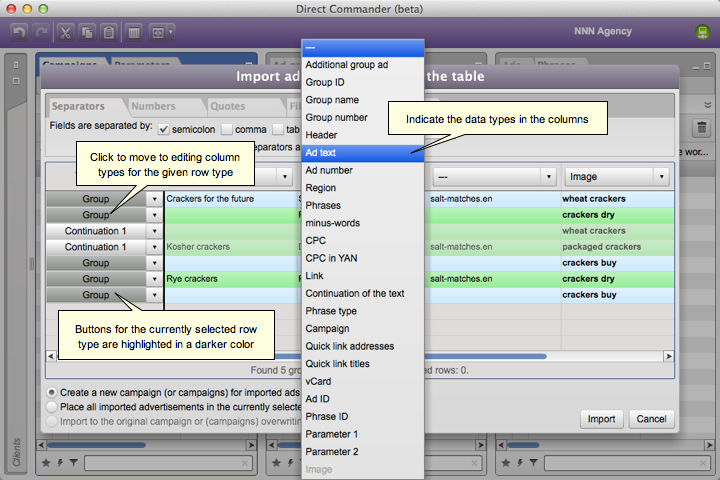 Specify the types of columns whose data must be imported to Direct Commander. For columns whose data does not need to be imported, use the type “---”. If the are rows with the type “Continuation <number>”, you must specify the column types for each type of rows: separately for the rows type “Group”, separately for rows like “Continuation 1”, and so on. Use the buttons with the names of the rows type to switch between types. After setting up the line and column types for all values you need to import to Direct Commander, continue downloading data.